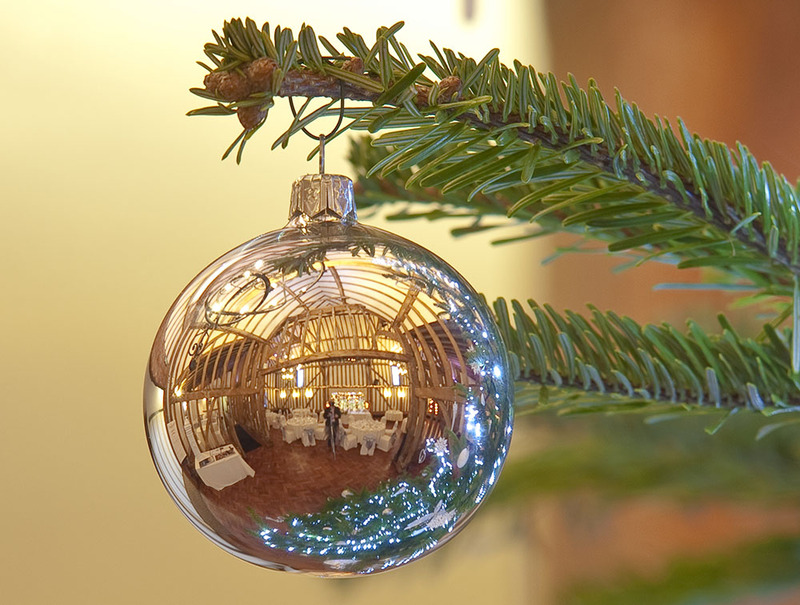 With ready-made romance and festive cheer, Christmas is the perfect time of year to get married; and Crondon is the perfect venue for your Christmas wedding. Summer may be the most popular time of year to get married, but with cosy dark evenings, festive good cheer, and a touch of seasonal sparkle, you have to go a long way to beat a Christmas wedding. As well as offering ready-made romance, Christmas weddings also benefit from being less popular than their summer counterparts. With lower demand, you will often find it easier to secure your dream venue and suppliers for your preferred date – without having to book years in advance! What’s more, with the summer-holiday season over, your guests are more likely to be available for a winter wedding meaning that you can say your vows surrounded by all your loved ones. Holding your wedding in that period between Christmas and New Year will also mean that many of your guests won’t need to take time off work in order to attend. And with people already in the party mood you and your guests are sure to have a wonderful time. Christmas weddings are undeniably magical, and Crondon’s wedding venue offers the perfect setting for your festive celebration. 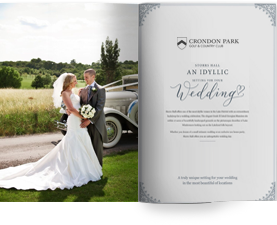 Situated in the beautiful Crondon Valley, Crondon Park enjoys breathtaking views across the Essex countryside, giving your wedding a naturally stunning backdrop that will make your photographs extra special, particularly if you’re lucky enough to experience a seasonal dusting of snow. And the venue looks just as great on the inside. Weddings take place in the Baronial Suite, comprising an elegant ceremony room overlooking the landscaped gardens, and the majestic Baronial Hall – a restored seventeenth century barn constructed from ships’ original timbers. With its oak beams and unique charm, the barn offers the perfect cosy refuge from the cold winter nights, particularly when decorated with atmospheric candles and twinkling fairy lights. 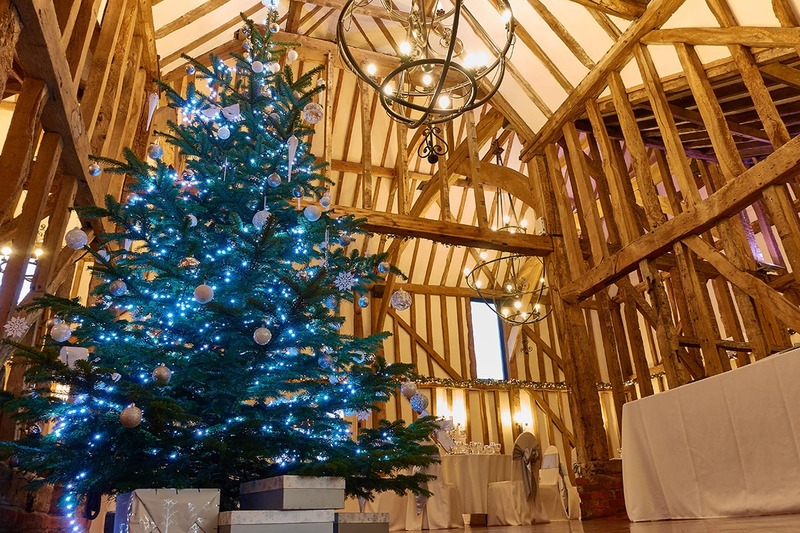 At Christmas time, the hall is home to a large, beautifully decorated Christmas tree, which offers the perfect seasonal backdrop for your celebration and ensures there is very little you need to do to this stunning space in order to wow your guests. Food is an important part of any wedding and with a Christmas wedding you can enjoy a delicious seasonal menu created by our head chef and his talented team. With a selection of festive favourites on offer, such as slow roast pork belly with all the trimmings and traditional Christmas pudding, you and your guests are sure to be left licking your lips. Why not wash down all that delicious food and help your guests get in the festive spirit with some warming drinks such as winter Pimm’s, sloe gin or mulled wine? Alternatively, you could speak to our events team about creating a special Christmas-themed cocktail which is sure to make your wedding stand out from the crowd. As we’ve already said, there’s very little you need to do to our venue in order to create a beautiful setting for your wedding. Just add some festive touches such as winter foliage arrangements, Christmas-themed stationery, mince pie canapés, and plenty of glitter and sparkle, for a truly special day that fully embraces the magic of Christmas.